This traditional floor lamp features a built-in tray shelf table, perfect for holding remotes, books and reading glasses, and more. Add traditional charm to your home decor with this beautiful floor lamp from the Hyde Park Collection by Kathy Ireland. The lamp features sculpted details that draw the eye upwards to a perfectly suited shade. the pole is in a bronze finish, while a frosted glass font comes with a night light feature. The tempered glass tray table the lamp has a bronze finish metal side rail. 65" high overall. Table is 28" from the floor x 16" wide. Base is 12" wide. Shade is 12" across the top x 20" across the bottom x 12" high. Uses one maximum 150 watt standard-medium base bulb for the top light (not included). 5 watt night light bulb is included. 4 position socket switch: top light on, night light on, both on, both off. Built-in night light feature behind pearl white frosted glass. 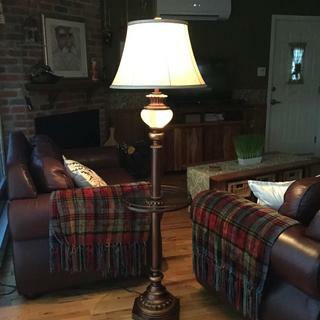 End table floor lamp. Base and column are in bronze finish with gold finish highlights. Cast resin construction. Tempered glass tray with metal gallery. This tray floor lamp matches the decor in our family room. I loved the idea of a night light. Liked the way it looked. The Design and the price. I like the look & the traditional styling. Will blend well with my decor. to replace one lost in fire and it looks really pretty! This floor lamp will suit my needs and it is very attractive. nice looking lamp and a reasonable price. can't wait to get it in mail and see if it lives up to reviews. This lamp looks like it will be perfect in my West Indies inspired Media Room. We have a stained glass lamp and the base needs to be replaced. I hope this one works. I think it will look great with a stained glass shade. We can use it's shade on another lamp. The colors will go well in my living room and I like the night light feature. I have been looking for awhile. The one appeals to me visually. I love the night light and the tray. Will sit nicely next to a bentwood rocker in our living room. I like the color, the fact that it has a small tray table and the night light is a plus I didn't think existed. Compliments vintage furniture. Nightlight is a nice addition. Need light and table in smallest possible area between chair and wall. This looks like an attractive option. I am decorating a traditional master bedroom for my client The lamp will be placed next to a chaise lounge in the bay window. It is made of Resin & not Metal..The last floor lamp was metal, & only lasted 5 years..It became pitted & very discolored only because we live on a Salt Water Canal & when we open doors the salt air comes in..The old lamp also cost more but could not be cleaned so it was tossed... I'm hoping this lamp does better, as need a good reading lamp beside a large leather chair.! Because I have a traditional home and it replaces a similar one I have had. 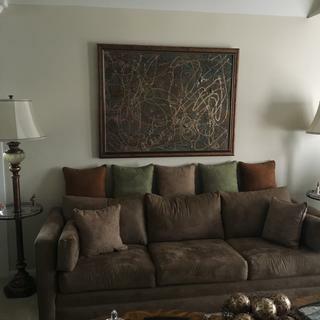 perfect piece to coordinate my great room furniture. Reviews were very positive. I am replacing a lamp/table that is very similar but its broken. I like the free shipping, reasonable price and the extra feature of the night light. Can't wait til it comes. hopefully the craftsmanship and materials are good. I already own one and saw this one on sale. Does this come assembled and ready to stand up? BEST ANSWER: Hi, the table lamp requires assembly. BEST ANSWER: It is on the top of the pole, under the main light. The color is yellowish-brownish, very close to what you see on the photo. It has a low power light bulb inside, that works together with a main light, or separately, depends on a switch position, so you could have small light, main light, or both. The round accent light has a frosted white glass globe. But when you activate the lamp it casts a warm, yes yellowish, hue. The switch allows you to burn only the round accent, only the top shade, or both. It is an elegant floor lamp. Kind of a goldfish color. Really nice - got the floor & table lamp. Love them both! It is kind of yellow. Stained like antique or off color. A small watt bulb inside. Goldish color. Got table & floor model. Love both!!!! How high is the table from the floor? BEST ANSWER: Measured from the floor to the top of the table measures at 27 1/2 inches. What is the width of the glass table tray? BEST ANSWER: Hi Sherry - the table is 16" wide. 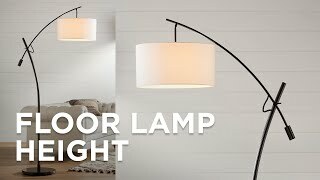 Do you have a lamp similar to floor lamp #V2759? BEST ANSWER: The closest floor lamp we have to this style is in the Kathy Ireland Muholland Floor Lamp. I attached an image for your consideration. The height of the lamp is 65". Is that with or without the shade? This is a floor lamp. Is the overall height the same? BEST ANSWER: Yes, the overall height of the lamp, with the shade included, is 65-inches. 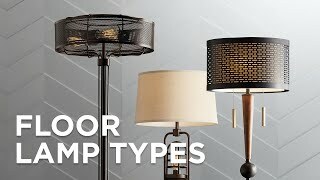 Yes, the lamp plus shade measures 64 to 65 inches from the carpet to the top of the shade. This floor lamp is beautiful. Yes, the overall height is 65" including the screw on top with or without the shade. It is the same with or without the shade as the stem determines the height. IS THE STEM OF THE FIXTURE ONE CONTINUOUS PIECE OR IS IT SPLICED SOMEWHERE? BEST ANSWER: The lamp came in pieces. The base, one section of pole, the tray, another section of pole, and then the lamps and shade. Hope this answered your question. Although the lamp came in pieces, the cord runs from top to bottom. You would have to take out the cord in order to separate the pieces. It is a few pieces but together when purchased. I had to replace a wire and got the fun of taking it all apart. There is only one switch controlling all functions. It is in two pieces. How do I replace the 5 wt bulb? How do I get the frosted glass off? I"m afraid of breaking the frosted glass. What is the weight of this lamp? BEST ANSWER: Can't say for sure probably around 15 lbs. Do you have to use the glass tray? Is it removable? BEST ANSWER: Unfortunately, the glass tray cannot be removed. I believe so. The lamp arrives in 3 parts as I recall and the tray helps connect the top and bottom rods. We had trouble putting it together, but it is really pretty and functional. Wine glass fits perfectly on that tray, LOL! Yes, the glass tray is integral to the lamp --- the bottom and top pieces meet there. What functions does the 4 position switch do? Use the night lights when not home to give the area light. I positively love this lamp. It is a very well constructed, sturdy lamp. This lamp is much larger than the lamp that it replaced, so there was a little adjustment period for me, but now that that's over I couldn't be happier. It is rich and impressive looking; the colors are perfect. The little tray holds a drink and a knick-knack beautifully. I'm very pleased with this purchase. We bought this floor lamp for our mother for Christmas and now are going to order the matching table lamps for her. She loves the floor lamp. I use this lamp to read by and also do some needlework. I like the glass tray, holds a drink & accessories. i would buy this product again very pleased. I've now had this table for a couple of years. It's beautiful and functional, but--especially if you have kids--you will notice wear and tear around the base. Any area that they may crawl around. There are now large patches where paint has pealed away. The middle nightlight is kind of a pain to change, but overall it is a great light. I plan on finally getting the matching table lamp. It is a well made lamp and a nice addition to the family room. The lamp base is heavy, and not likely to tip over. It is kind of retro in style. This lamp was specified for an older single woman who uses the nightlight! VERY HAPPY WITH THIS PURCHASE. LOVE THE STYLE OF THE LAMP. GREAT FOR THE LIVING ROOM. GREAT FOR MY READING AREA. 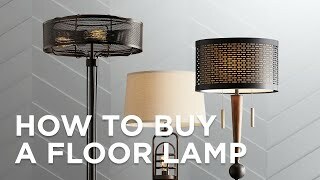 I will definitely buy again from Lamps Plus! Item was delivered promptly and package was in excellent condition. A good looking lamp and practical. Delivery was when stated and the parcel came in perfect condition. The lamp is a classy addition to the sitting area in my bedroom. Overall, it is an attractive and functional floor lamp. My only complaint is that it does not have a 3-way light feature. I really am very pleased with this lamp and have received many compliments. The night light is so nice! Very please with our purchase. Easy to assemble. Well packed. Beautiful lamp, I liked it so much I got two of them! Great impression! Stephanie is a wonderful representative for the store. Absolutely love this lamp! After a problem with the threads on the base part being stripped and having to re-box the first lamp and return it, I’m thrilled with this second lamp we received. When I called to get a return label, I talked with Stephanie, who was so very helpful! And, she ordered the second lamp for me. Both lamps arrived at my home in record time. I would order from lamps plus again. The lamp was very well packed, although it was difficult getting it out of the box. It was easy to put together & it looks great in my living room where I needed light & a small table. It’s well made & sturdy. We are very happy with our new lamp. We were not happy with Fed Ex, who delivered the lamp two streets away. Fortunately we were notified and went to pick up the heavy box. Love these lamps. They have weight. Not light or flimsy. Very attractive. I ordered 2 for my living room. Immediately received compliments on them. Easy to assemble in 5 minutes. Packaged nicely. Takes more effort to unpack them than it does to assemble. You won't regret getting them. Very nice! Lovely lamp. So far no issues and have been been a great compliment to my room. I love it! The ability to just have on the bottom light which provides a nightlight effect is great. Well put together and very sturdy. I would definitely buy it again or tell others to purchase! This lamp fits my living room perfectly. Only issue I had in assembling the lamp was I didn't see the silicon pack that was inserted into the lamp socket so that the light didn't seem to work when I turned the switch. I received a quick response from Customer service and a technician when I called. A three way switch would make the lamp perfect. I really like this lamp because it is taller then the one I had before, it was similar to this one. The pictures are much brighter (it is my military wall) now. Pure elegance! Looks beautiful in our living room just like it was designed for us in mind. We’re so happy! Beautiful lamp. Love the night light. Based on the quality and price, I would highly recommend this lamp. I am using it in a den next to a couch. It is the perfect size as I don't have room for a table with a lamp so this combo works well in the space I have. Sufficient table area to place the remote, a book or your glasses. I like the lamp very much. Yes I would recommend it. My dislike was taking it out of the box and putting it together. It was a job. Highly recommend. This is a quality lamp with exquisite style. High quality, sturdy, pretty lamps! I have ordered 3 lamps from lamps plus and I love them all! Delivery as promised and beautiful products! I highly recommend this company! Lamp has a scratch across metal that wasn't noticed until we put lamp together. I emailed customer service to see if they could provide something to cover the scratch. Never received any response. Hi Diane R., so sorry to hear that your lamp has a scratch and that our customer service team has yet to respond to your email. Would you please try once more to reach out to us by phone, email or chat so that we can assist you? Thank you. This traditional swing arm floor lamp is finished in rich bronze and offers adjustable traditional lighting and style to any room.